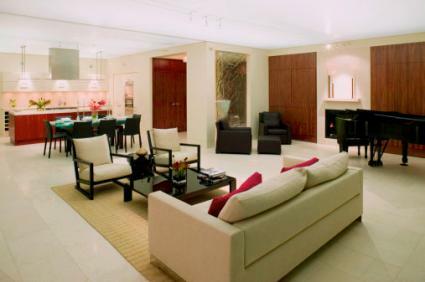 Rugs work as enhancements of good chi flow and as remedies for too much or not enough of any one element in your decor. You may have great feng shui in your home, but also want that little extra boost of positive energy. The right rug could do it for you. There are five elements in feng shui and they interact with the bagua map of energy centers in a space. Each element is associated with certain colors and shapes -- fire/triangles, water/curves, earth/square, wood/rectangles, and metal/round -- that help provide more data to help you find those magic carpets. Start with the main entry, the mouth of chi, the point at which positive energy enters your home. Expand a modest entry and welcome that positive chi with a vibrant oriental runner in shades of reds and oranges to draw the energy into the home. 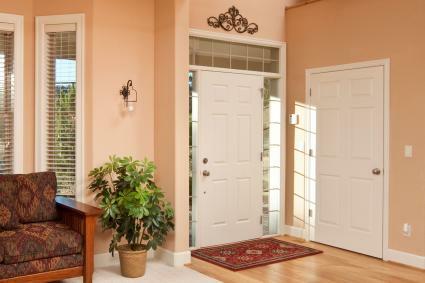 If the front door opens into a compact space, a round rug and its metal energy will strongly encourage the chi to flow. When the front door opens directly into a room, a small area rug helps to define the space and create the sense of a gateway or portal, filling in for the missing formal entry. In the living room, energize the Southeast wealth corner with a zigzag patterned rug for fire. Red is the color of wealth as well as flames, so an angular pattern with colors in the red family is doubling down. The Northwest helpful people area will be a magnet for inspiration and creative collaboration with a nubby, moss-colored rug to summon wood energy. Consider the overall balance when determining where to place a rug. A rectangle that pulls the sofa, side tables, and chairs into a warm conversation area optimizes the good feeling in this most public space, more low-key convivial wood. If the decor is all-white or shades of gray, balance that yang metal element with a blue or black patterned modern design rug to introduce the calm and clarity of water. 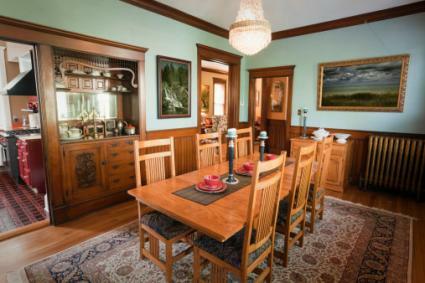 Wood floors, wood table and chairs, wood buffet, and sideboard are usually in the dining room, so counter all that wood with a pumpkin-colored carpet for a little digestive fire and conversation sparking. Match a traditional hand-loomed rug, a reclaimed over-dyed antique, or a swirly contemporary design to your decor style. The rug should be large enough for at least 24 inches overlap on all sides so chairs may be safely pushed back from the table. Skip the dense pile and the shags unless you love vacuuming crumbs. And forego the lovely carpet if you regularly feed small children, until they are older and less messy -- spills and stains attract very sticky energy. A cook's kitchen is kinder to the cook when a tile floor is softened with a rug; whatever fits and looks good is the right rug for that work space. A natural hemp runner in a galley kitchen is earthy and nurturing; the rectangular shape increases creativity, and praise for the chef. A flat-weave variegated yellow rug adds energetic cheer to a breakfast nook. If it's round, metal's mental sharpness might help to kickstart your day. 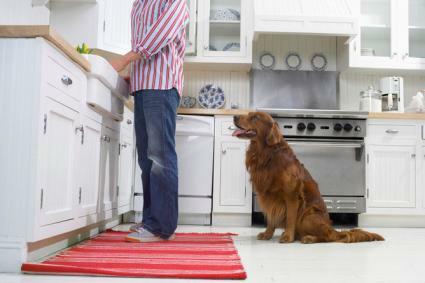 Smaller washable rugs are smart for kitchens because ground-in grime invites stuck energy. The kitchen is too important to the health of the family to risk that. Bedroom rugs are like pillows and fluffy duvets -- they are all about the comfort. But the rug can be a remedy for an inauspicious bedroom layout as well. Softer colors are soothing in a sleeping space; for romance, think of shades of muted pinks or salmons, not red. For refreshment and renewal, go with a jade or a spring green. Blues are tranquil and encourage sleep. A round rug is balancing enough to mellow the effect of so many corners and angles -- the bed, nightstands, dresser, closet doors. If the only place for the bed is the corpse position (footboard pointing towards the door), use a beautiful colorful rug and a tall bench at the foot of the bed to "block" the unhealthy energy drain from the space. The bathroom rug can be any shape that fits in the room but the pile should cushion and absorb so the rug earns its keep. Shades of blue for the calming flow of water or earth tones in the brown-beige-natural spectrum for the security of earth energy work well with the hard surfaces of metal, porcelain, and tile in a bathroom. If you choose a white rug to match all-white bathroom decor, add a wooden stool, a terra cotta pot or a green plant to balance the strong metal energy and provide some visual relief. Set up your home office with the fame, career, and wealth areas in mind. This is where some yang energy will boost your productivity and prosperity. A large area rug -- a vivid Bokhara or a Shiraz -- under the desk and the client seating in front of it looks professional when you have business meetings at home. 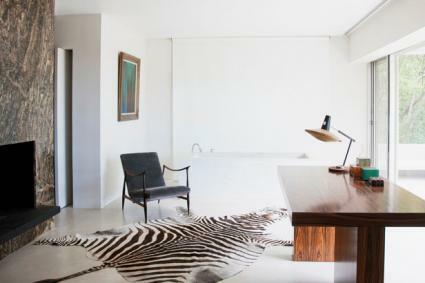 A more solitary home office is the place for a dynamic contemporary rug or the luxury of a faux animal skin to punch up the electricity and add a note of sophistication. Choose angular shapes in the rug's pattern for passionate, expansive fire energy, rounded shapes and circles for hyper-focus, mental-sharpness metal energy. Pick a faux skin rug with noticeable black in it to summon the flowing abundance of water energy. Stick to faux, though, so your career isn't derailed by negative karma. Whatever rugs you select for your carefully arranged space, they should make you happy each time you see them. A jolt of aesthetic pleasure is extremely auspicious feng shui energy to revisit again and again. Use feng shui principles to help narrow down the many choices. But go ahead and match that purple silk lampshade you'll never abandon with an overdyed plum rug in the living room. 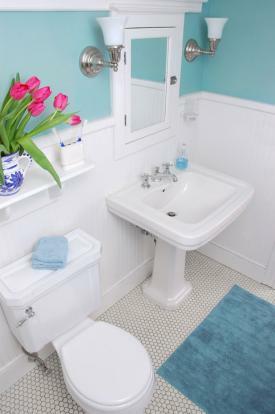 Risk an eye-catching teal rug with bright orange carp swimming on it in the bathroom -- maybe just tone down the towels. Put that faded scarlet and gold Khotan dragon rug next to your bed. Just balance it with a couple of phoenix pillow shams to enhance your love and luck. Don't settle for the bare boards when you can lay a lure for chi on your floors with a few well-chosen and well-loved area rugs.